Wow, things have changed drastically since our last active posts to our website. We're still in Seattle, but now have a wonderful 3 year old and a great house in the Phinney/Greenwood area of town. Yes it's true. Seattle is sunny in the summer. It's the area's best kept secret! We found a cute little rental house in a great location - close to the freeway, grocery store, and Greenlake (for dog walking and running). It's been fun settling in. Backpack travel for 2.5 years didn't seem so bad at the time. We are now living like most people our age with our own bathroom, bed, kitchen, wardrobe and internet. Unpacking is like a birthday celebration. After having only 2 pairs of pants, 2 shorts, and a few t-shirts for so long, our wardrobe now feels massive and complicated! While it's nice to have our own place, all the stuff we've accumulated over the years is quite overwhelming. Our large Goodwill pile is a true testament of our new "less is more" theory on life. We both feel a longing to get on the next plane flight, and we've only been home 3 months!! It seems that our around-the-world journey has instilled a deep need to continue our explorations. We can't wait until our next vacation! Vacation. Hmmmm.. The only way we will be able to take a vacation any time soon is to get jobs! It has been a while... We'll begin our search soon - most likely after very slowly unpacking our last few boxes. We are both looking forward to getting our brains on something. We haven't become lazy slobs just because we haven't worked these past couple of years! We flew down to Austin a week ago to begin the process of moving our stuff out of storage up to Seattle. Also, we're really excited to have seen our dog the other day at EJ & Gideon's. 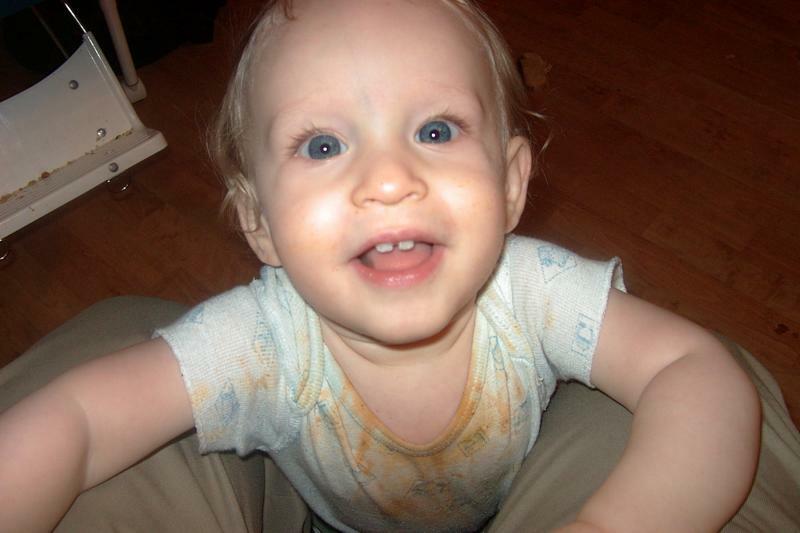 Our nephew Isaac is very cute and has a ton of blond hair. This past weekend we ventured over to Shreveport, LA to visit M's Dad and step-mom Barb. They took us out to a couple of great meals, and we really enjoyed spending some time with them. 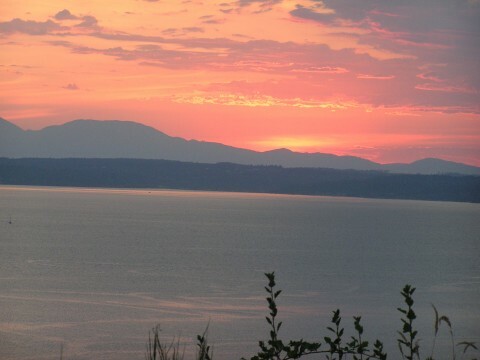 We are planning on loading up the moving truck in about 10 days or so and beginning the long drive up to Seattle. In the meantime we'll be shopping for a few pieces of furniture. It's actually a pretty fun process... More later. Our journey is now over and we are having some bittersweet feelings. On one hand, we are very happy to be back and moving on with our lives, and on the other hand a bit sad that our travels have ended. The past two weeks have flown by. It's pretty surreal to be sitting in a coffee shop at Lake Tahoe logged into the web and updating our site. We left Kuala Lumpur in time to attend a wedding for Marisa's cousin Rob and now wife Laura in Long Beach. Also, we were able to catch up with our friends David & Margot and they were nice enough to let us crash at their awesome house and borrow a car to head down for the wedding. The wedding was great fun, even though we were horribly jet lagged and had a hard time staying awake past 6pm. It was also great to catch up with Marisa's Dad and step-mom and the rest of the family. Also, we were dressed up for the first time in over a year...it wasn't so bad. 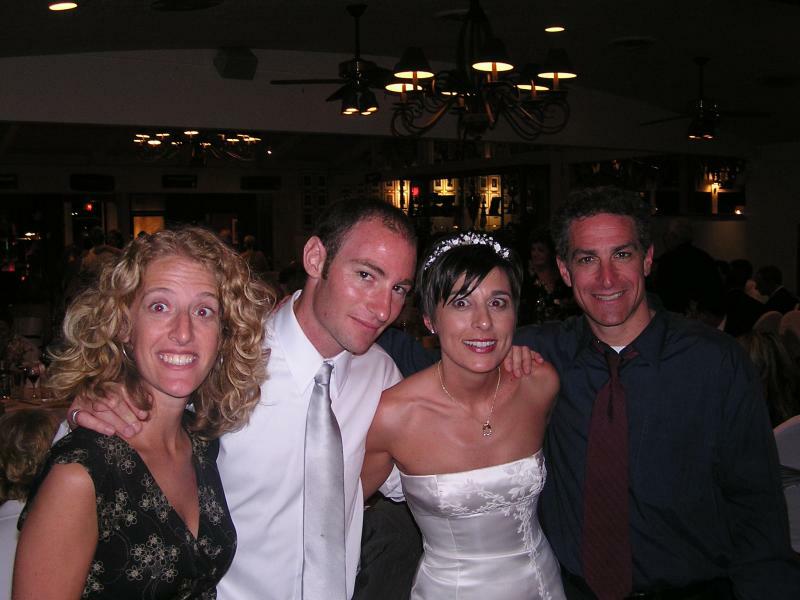 Here's a photo of the happy couple with Marisa and her other cousin Pete (don't let the dazed in the head light look scare you, Marisa is wanting to take a nap right about now.. Heading North out of San Fran we had a fun time visiting another of Dave's cousins (Curt & Kelly) in the Medford, OR area. We then headed out to Bend, OR to hang with Dave's parents for a night, where they were spending spring break. The drive over the pass was just beautiful and full of snow. We were in a new city almost every day and finished it out with a visit to Jon, Jen, & Brynn's house. It was quite amazing how much Brynn has grown since Thanksgiving time. What a cutie! We are now chilllin in Kuala Lumpur, simply called "KL" by those in the know. Much like downtown Bangkok and Hong Kong, KL is full of shopping malls and is pretty sprawled out. However, there doesn't seem to be as much pollution here. We are only in KL b/c we found a VERY cheap flight home originating here. So, we aren't doing much except a little shopping. It's been a while since we walked around the mall and thought of wearing anything other than flip flops and the stuff in our backpack. Our little shopping excursion was much more exciting than we had anticipated! The past few weeks have gone by so fast! We will most likely update our jounal next week at Linda & Joel's house with all our pictures and adventures in northern Thailand, Ko Phangan, and Cambodia. It's been hard to keep the site updated since we've been moving around so much. The connections are not very fast either, making photo uploading painstaking. We look forward to catching up with everyone after we get settled in. After both a ferry and long-tail boat ride, we settled in for our last week of our 2 year journey. We stayed at a place named The Sanctuary Resort - Spa & Wellness Center. This island was much bigger than Koh Bulone Lae. Every month ~10,000 people gather on one of the beaches on Koh Phangan to celebrate the infamous Full Moon Party (missed it by a week or so). 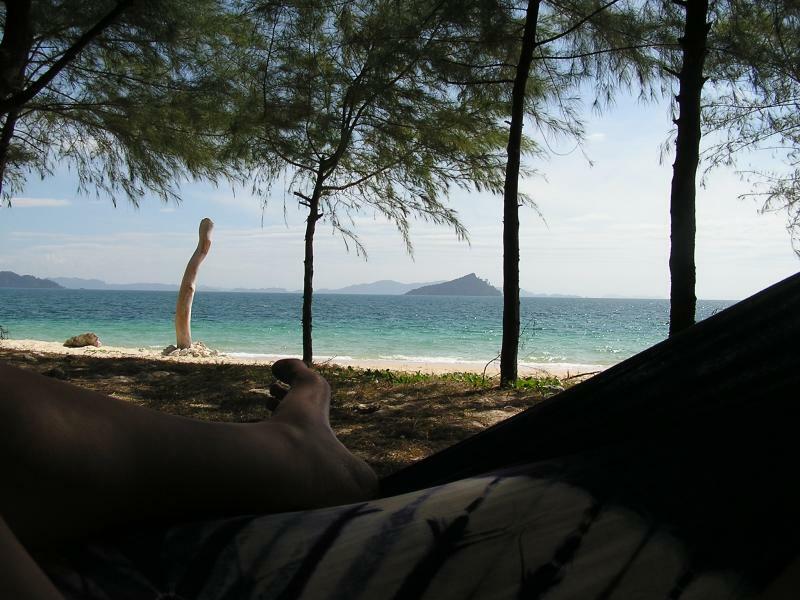 Unlike KBL which has no roads, no streets, and no spas, Koh Phangan has cars, buses, taxis, spas, hotels, resorts, and much more. However, we found a small slice of paradise at The Sanctuary because it's isolated - only reachable by long-tail boat. Similar to KBL, but they also offered a spa, yoga, and a wellness center. On arrival we grabbed a smoothie at the wellness center and were talked into (didn't take much) to participate in a 3 day cleanse and fast. That's right - no food, only a strict regiment of herbs and shakes to help promote the bodies natural ability to clean out toxins and begin healing itself. We figured, why not! We've been doing a pretty good job of eating healthy as we travel, but it seemed like a good opportunity to clear out all the German Brats & Beers and Turkish Kebabs. What the hell, we had nothing else to do except sit around on the beach during our last week. The 3 day fast turned into 7 days after talking with many folks who were just completing a 7 day program. They felt and looked great, literally glowing, so we decided to go for it. Besides, we felt great on day 3, never feeling hungry, lethargic, or nauseous like some of the other participants. All in all, it was a great week because we met some great folks (along with some very strange rangers) and shared in this unique experience with others. Our days consisted of several doses of herbs, shakes, and juices starting at 7am and finishing in the evening over DVD's and vegetable broth with lots of chili pepper. The soup was a great end to our day and tasted as good as a big 'ol steak dinner to us. After a week we down to our fighting weights, felt great, and were ready to start eating again. We spent our days lounging in the sun and reading up on lots of nutritional information. On day 5 we did feel pretty lethargic and generally yucky. Not sure if it was because our bodies were releasing toxins or because we needed some real food. Either way, we made it through the day and were rewarded with soup in the evening. 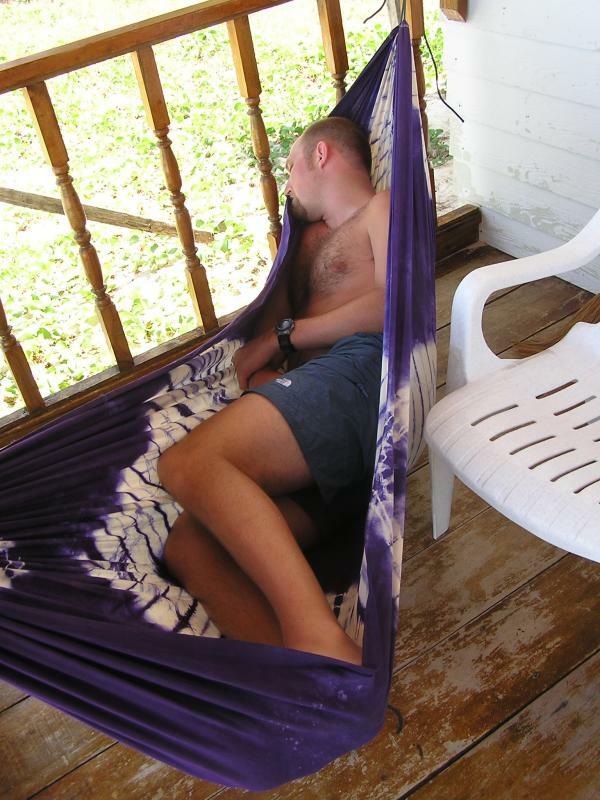 Also, the wellness center had a great chill out area with hammocks, pillows, and chairs to make hanging comfortable. The center also had a herbal steam room, spa, and massage services along with a herbal tonic and juice bar. 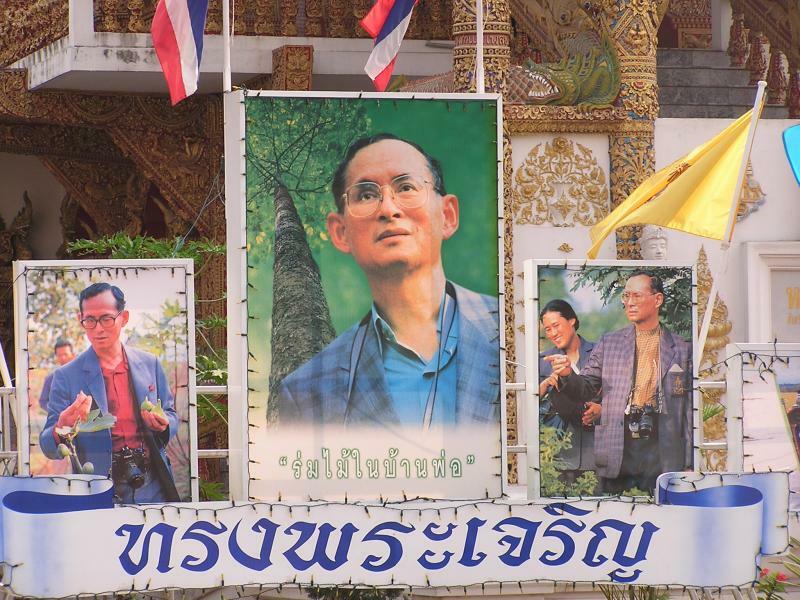 Chiang Mai is filled with travel agents offering many types of hill-tribe treks, cooking school classes, and elephant camp visits. We decided not to go to one of the touristy elephant camps after learning about Elephant Heaven, an elephant conservation center. It turns out that most of these tourist outfits don't treat their elephants very well - overworked and controlled with ropes and chains. We would have never known this and gladly taken a trip with one of those of those outfitters had we not stumbled upon Elephant Heaven. As we described from our visit to Pai, the air in Northern Thailand is full of soot and ash as people are burning down the forest to make room for more farmland. 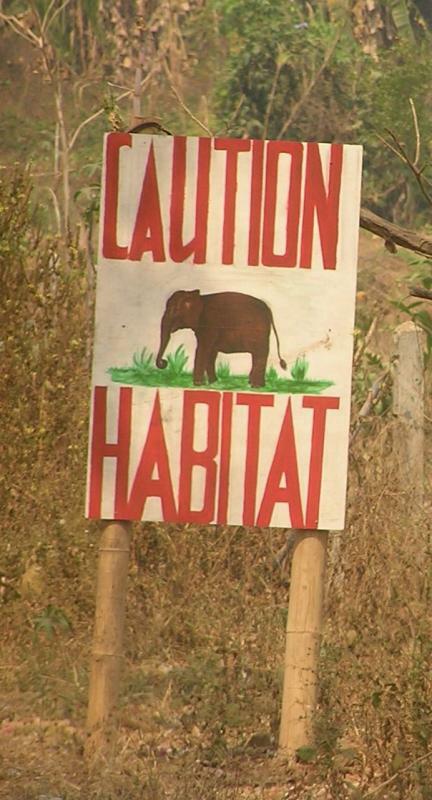 As the population continues to boom and clear the land, wild elephants are left with no space to roam. Also, domesticated elephants, whose occupation was logging until it was banned in '89, have no understanding of how to live without their handlers. These domestic elephants are now employed at elephant camps for tourists or can be seen with their mahouts (handlers) begging for food on the streets of Bangkok. Wild elephant numbers have dropped by 95 percent over the last century! 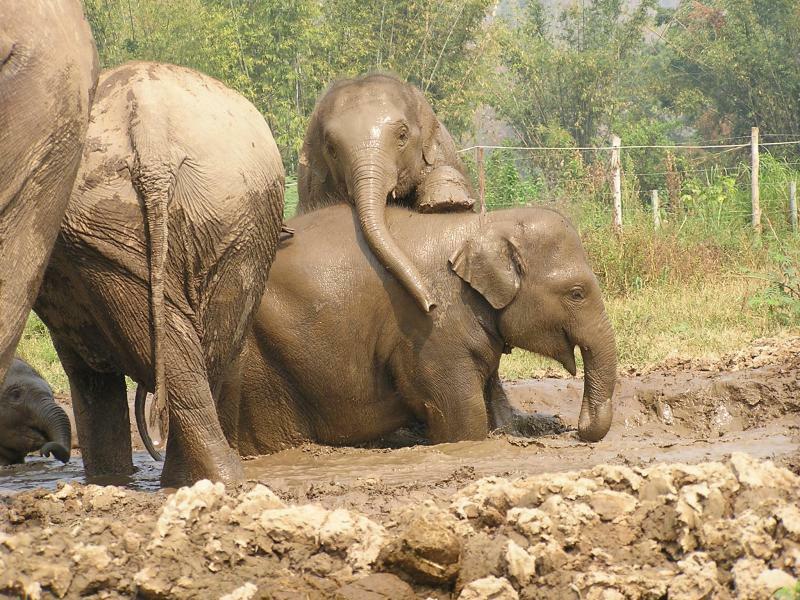 Elephant Heaven is a conservation camp founded by Sangduen "Lek" Chailert for abused working elephants. 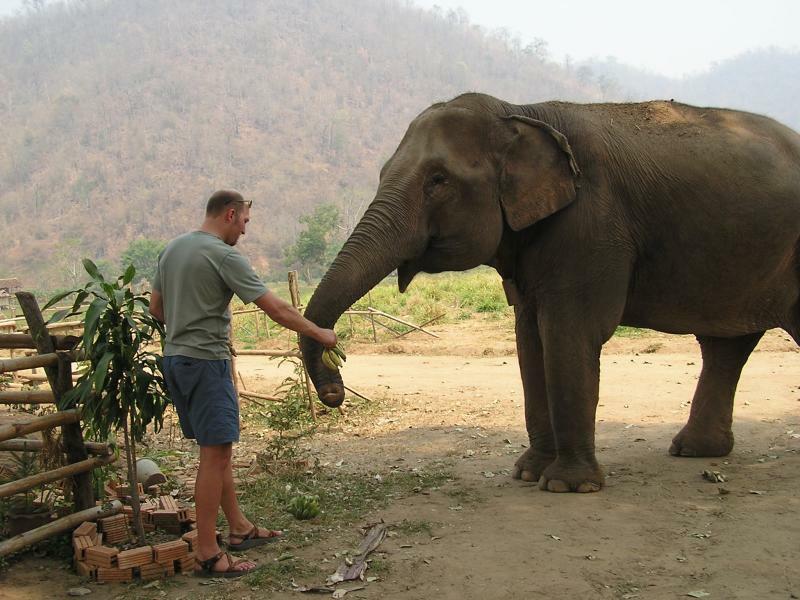 Lek also provides free elephant medical care to anyone who asks throught the country. At her camp, elephants live without chains for the first time in their lives or are born into a life of freedom. Follow this link to learn more about the camp and the some of the herd we met during our visit. It took us an hour to drive to the hills where we ate lunch and watched a National Geographic video which won a bunch of awards (Genesis Award, a Cine Golden Eagle Award, a Finalist Award at the International Wildlife Film Festival, and was nominated for an Emmy). Good stuff. It was a tear jerker and gave us an appreciation for Lek's hard work. We learned about the trials and tribulations these animals were put through in their working lives. After the video, we got to hang out with these gentle giants now living in freedom for the first time in their lives. Lek (the founder), the mahouts (elephant handlers), and the volunteers love these animals and just want to provide these animals a bit of peace. Too bad we didn't know about this place earlier in our trip, or we would have spent a few weeks there volunteering. The street side vendors have very tasty food (most of the time) and it is only about $.20 for big plate. Also, they sell a miriad of fresh fruits and vegetables. It's pretty cool when you get to know the pineapple vendor outside your guesthouse. It's pretty easy to drop some lbs. 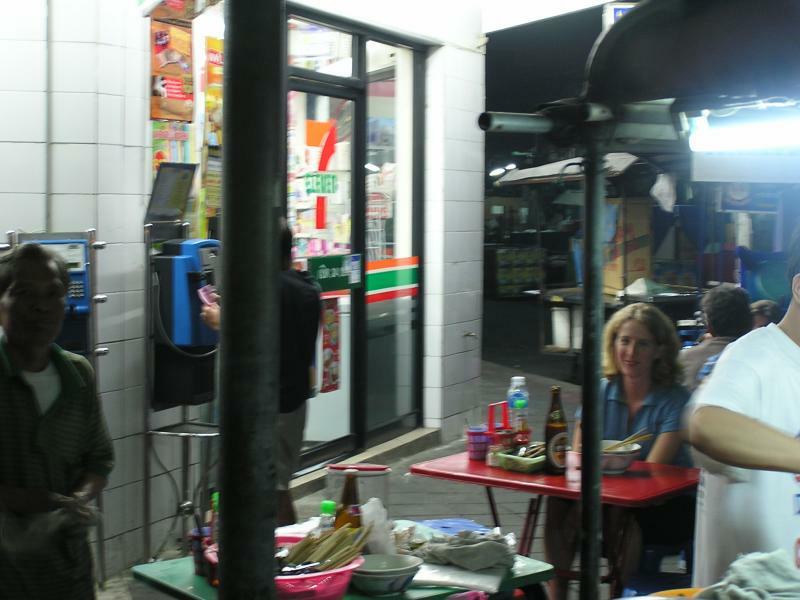 while traveling in Thailand, as the food is fresh and for the most part good for you. As we mentioned before, we were able to catch a movie at a mall which had 7 floors. It's pretty fun to visit the mall because each floor has different item. For instance, floor 5 is the cell phone and electronics area full of individual booths with the proprietors loudly hawking their items. The next floor down is the home furnishings floor also full of individual vendors stacked elbow to elbow selling the same stuff available at the Chatachuk Market, but for about 2x the cost. Thankfully, we visited the market long before we made it to the mall. We hit the most visited tourist site in town first thing in the morning to avoid the big tourist buses and beat the heat. The Grand Palace is the former residential palace of Kings Rama I to Rama IV of Chakri Dynasty between 1782 and late 1800 A.D. and is famous for its stunning architecture. It's surrounded by high white walls and occupies an area of about a square mile. 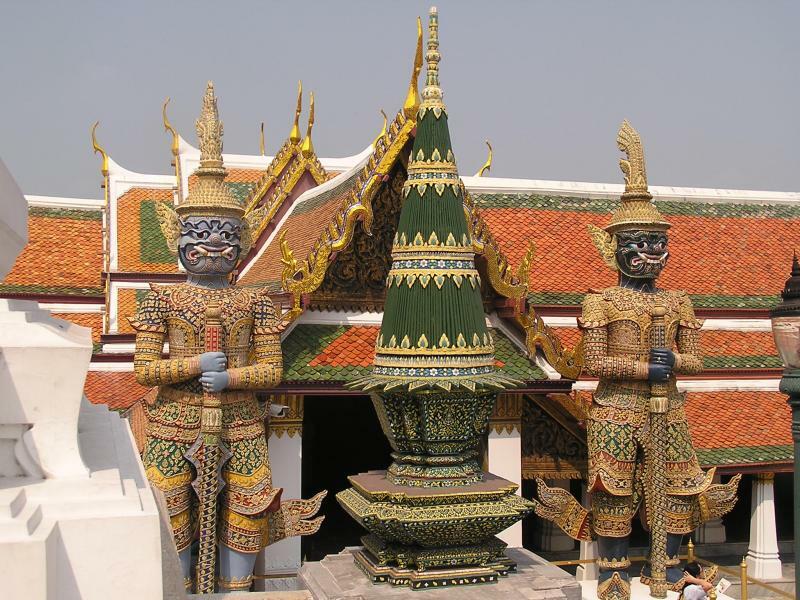 On the Grand Palace grounds, stands Wat Phra Kaeo, the royal chapel and Temple of the highly revered Emerald Buddha. 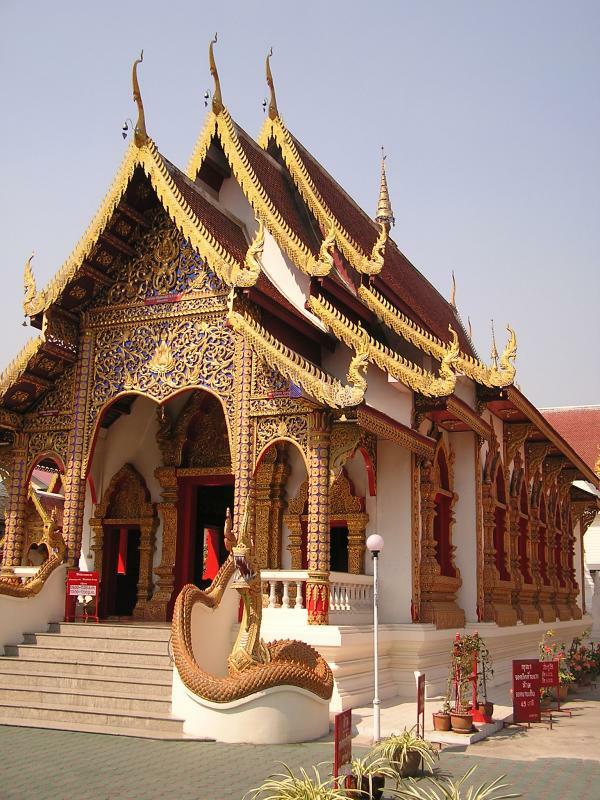 The temple was made famous by the Emerald Buddha which is carved from a single block of emerald to a sitting posture of the Buddha 30 inches high. 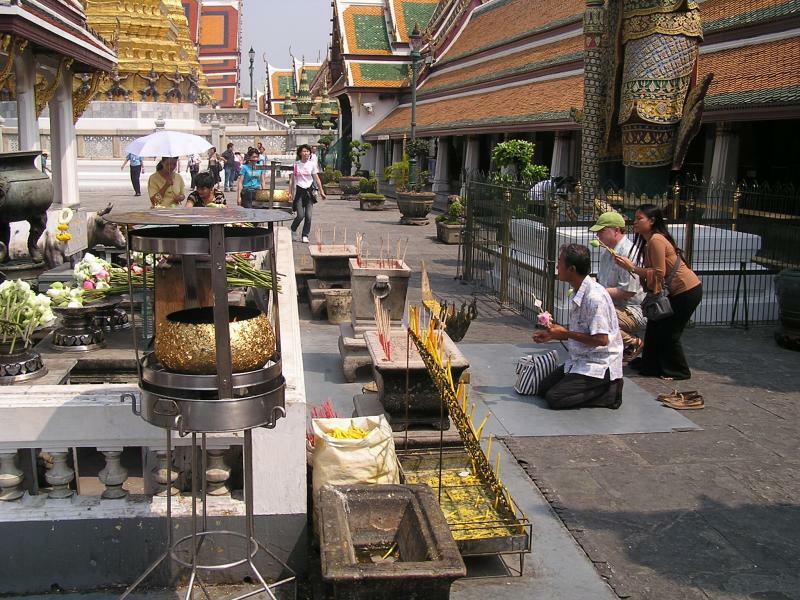 Buddhist pilgrams and tourists from all over the world come to visit and to pay homage to the Emerald Buddha. We removed our shoes and went inside the temple for ~ 5 minutes. What a peaceful, spiritual place....No pictures allowed! We signed up with a tour company to go visit the floating market. Since we didn't make it to Venice, we thought it would be fun to check out this diverse network of canals, locally known as "Klongs." Until recently, the residents of Bangkok did a great deal of commuting by small boats on the Klongs. 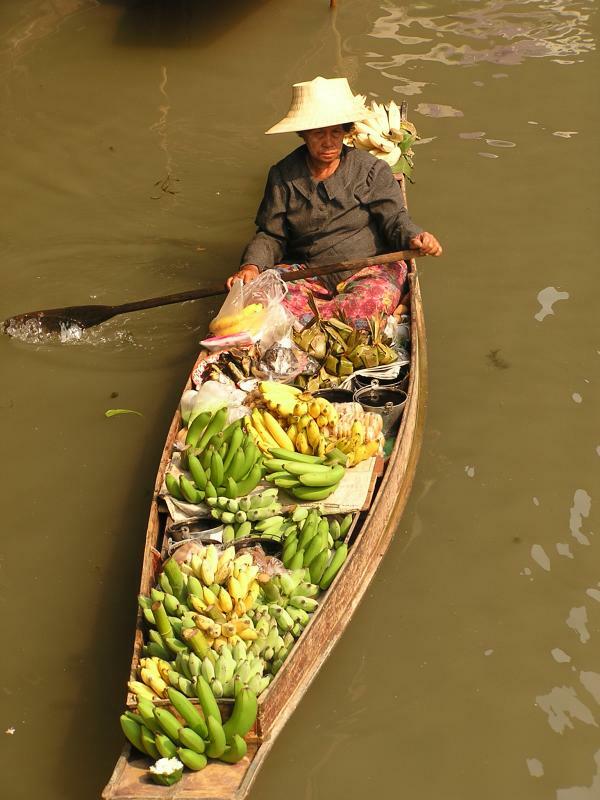 Commerce throughout Bangkok was often conducted on boats, and merchants would take their fresh produces by boat each day to the so-called floating markets, where they would meet and conduct trade. We took an hour ride out to one of the markets and got on a boat to check out the floating shops of all kinds: fruits, flowers, culinary tools and food, textiles, spices, and much more. VERY FUN! 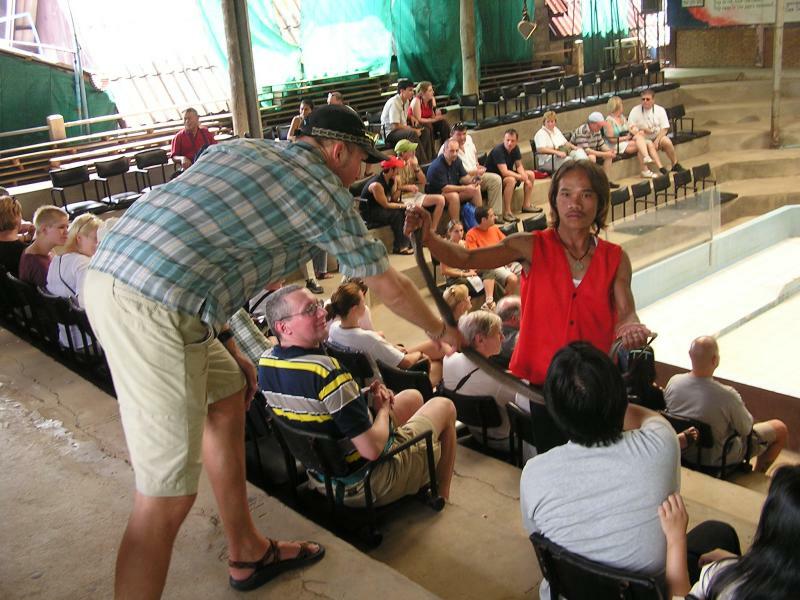 A trip to the Snake Farm was included in our tour to the floating market. Dave loved this place because he got to touch a real live cobra! The snake handlers start their careers very young and work their way up to be performers when they are not milking the snakes to produce anti-venom. The announcer was like a ring master at the circus describing the thrills and sensations of the snake show with much style. 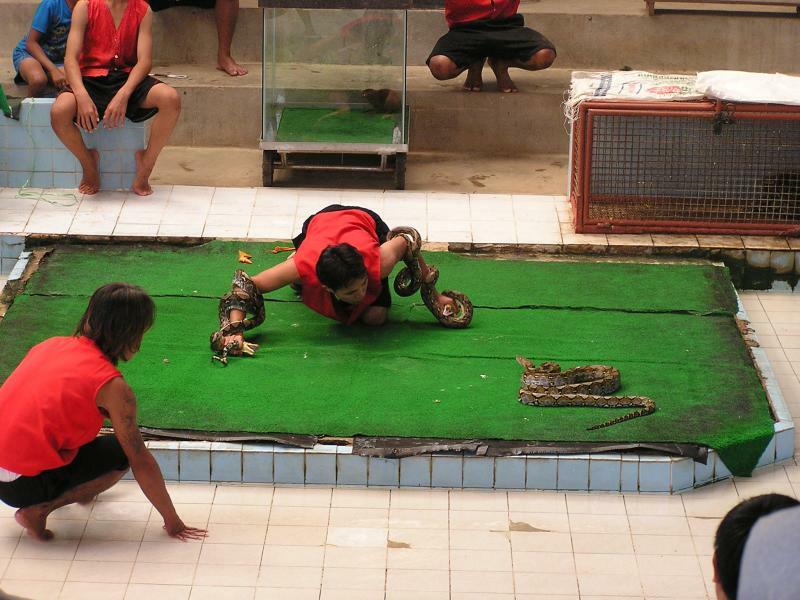 The snake handlers were very brave and showed this while wrestling 3 snakes at once! 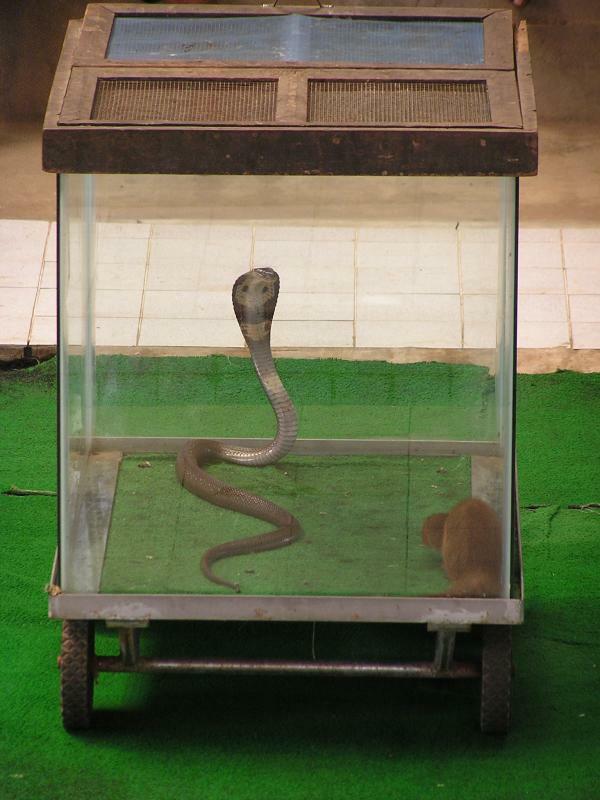 Also, they did a show with a mongoose and cobra in a glass box. Did you know that a mongoose is one of the only (maybe the only) animal that can attack and kill a cobra? It's pretty cool. The mongoose didn't kill the cobra at the snake show, just held it down and then the handlers separated the combatants. No harm, no foul! With only 5 days left in northern Thailand, we left behind the hustle and bustle of Chaing Mai for a small town called Pai. We were told that this would be a good place to chill for a few days, go on a hill-tribe trek, raft, and hike without being too touristy. The four hour ride halfway to the Burmese border from Chiang Mai was along the typical Thai roads - twisty and bumpy. The bus driver made like Mario Andretti and passed all the slower forms of transportation along this mountainous route. We are serious this time, NO MORE BUS TRIPS! Pai was not exactly the peaceful haven we were expecting. It is a picturesque town, but people have found out about it and it's become very touristy. Pai is in a mountainous region which is green most of the year, but we hit town right at the end of the dry season. Farmers were preparing their fields for the new season by practicing slash and burn. Let's just say that visibility was very low and the air quality sucked. We couldn't even see any of the nearby mountains, nor could we go rafting because the river was too low. However, it was fun wandering around this little village and seeing all the creative ways the locals would use to differentiate their businesses in the town. We decided not to go on a trek to visit the hill tribes as we had originally planned. First of all, with all the smoke, we wouldn't have enjoyed hiking very much. Also, we couldn't find a company who was running an authentic trip. We didn't want to be paraded through a village for 15 minutes and stare at and take a bunch of photos of a bunch of folks, too voyeristic. We were looking to spend time with the tribe to learn their customs, even stay overnight if possible. No such luck. We'll find a way to do that some other time when we come back and visit another town called Mae Hong Song which is West of Pai and much less touristy... We did manage to sneak one photo of the Pai River early in the morning. The smoke wasn't as thick, but it was still pretty bad. You'll notice that you can't see the mountain behind the hut and trees. Oh well. We did manage to do a few things while sick to keep away the boredom. 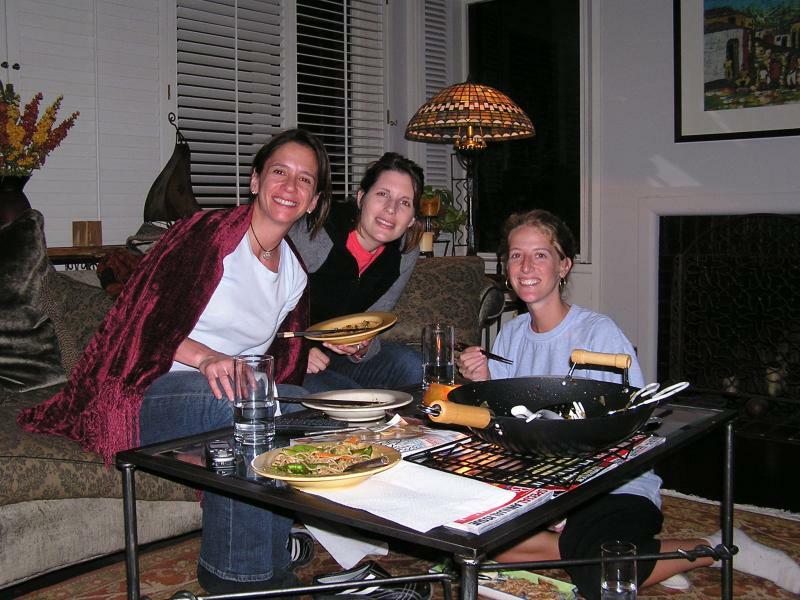 Our guesthouse offers 1-2 day classes for cooking school, a very popular and inexpensive activity. 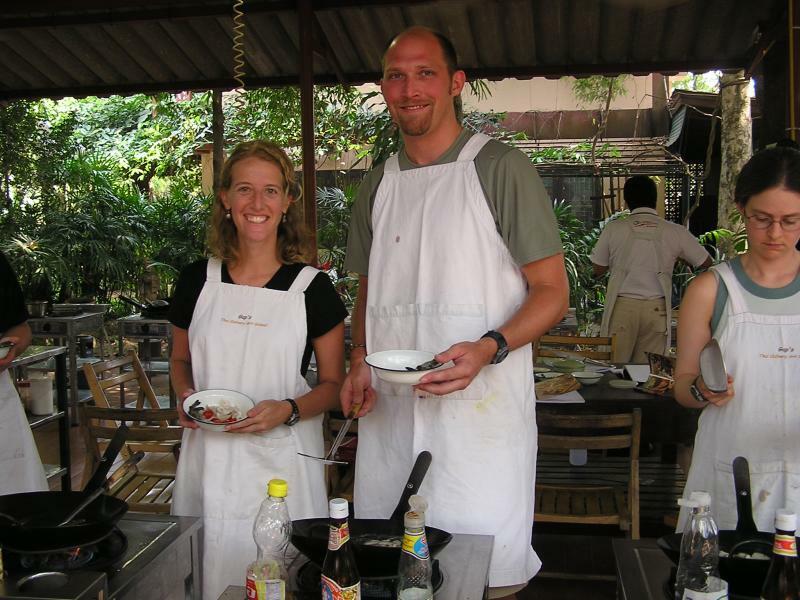 With five other English speaking folks, we donned our aprons, recipe books, and learned how to cook eight Thai dishes throughout the day. We started the day with a visit to the local market and learned about all the veggies and spices we’d be cooking with. Most were familiar, but some were indigenous only to SE Asia. We arrived at the school which consisted of an open air canopied kitchen with about 16 cooking stations. Luckily, our class was small which made it a really fun experience. The head chef John was a crack-up. He was like Emiril on TV in the States saying “Bang” every time he needed to emphasis something, except that said in a nasaly Asian accented, “ahhhhhhh”. I think you had to be there as it was pretty hysterical. It was informative, fun, and interesting as we learned some of the Thai staples: of course Pad Thai, spring rolls, Tom Yum Soup, chicken & cashews, and a sort of fish soufflé. Let’s just say we didn’t go hungry that day. We also learned how to carve onions to look like lotus flowers and make roses out of tomato skins. All in all, it was a great class but I don’t think we are going to end up guest starring on the Iron Chef any time soon! Our classmates were a varied bunch from the US, Britain, Switzerland, and Australia: A folk singer, chef @ Spago in LA (why he in a cooking class? ), interior designer, and a P&G marketer. Much of our time was spent wandering around town. Every few blocks we stumbled into one of the many beautiful wats (temples) in the neightborhood. This was our first chance to get a close up peak at them. There are usually monks inside willing to chat it up and say a prayer to Budda and light some insense for you if you make a small donation. We also visited the famous Night Bazaar for some shopping. The vendors are lined up on both sides of a main road hawking their wares. You can find anything: baby clothes, pirated DVD's/CD's, silk pillowcases, textiles, t-shirts, GOOD fake watches, photo albums, wood carvings, etc.. A shopper's paradise. Since we don't have a house, we shopped for items that might look good in any home. Hopefully our choices are good ones! 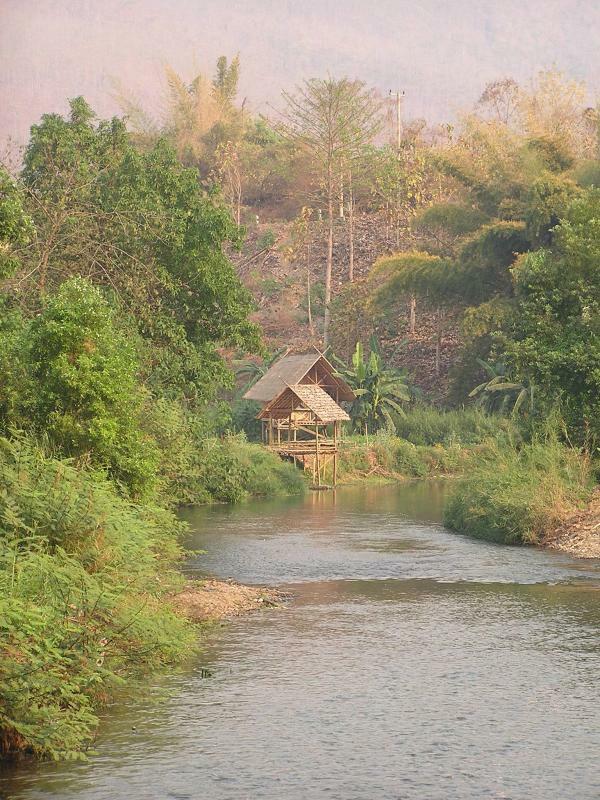 In a couple of days we are heading out to do our hill tribe stuff and hopefully head of to Laos. However, we may end up staying in Northern Thailand for a while longer as the water the Mekong is supposedly quite low. This would prohibit us from our much anticipated float down the Mekong from the Thai border to Louang Prabang. If we can’t float, we’ll just spend more time here. No worries. It was pretty easy to find a guesthouse. The internet and our used copy of Lonely Planet are pretty helpful. We didn't know whether or not to expect someone from the guesthouse to be waiting for us outside the airport. 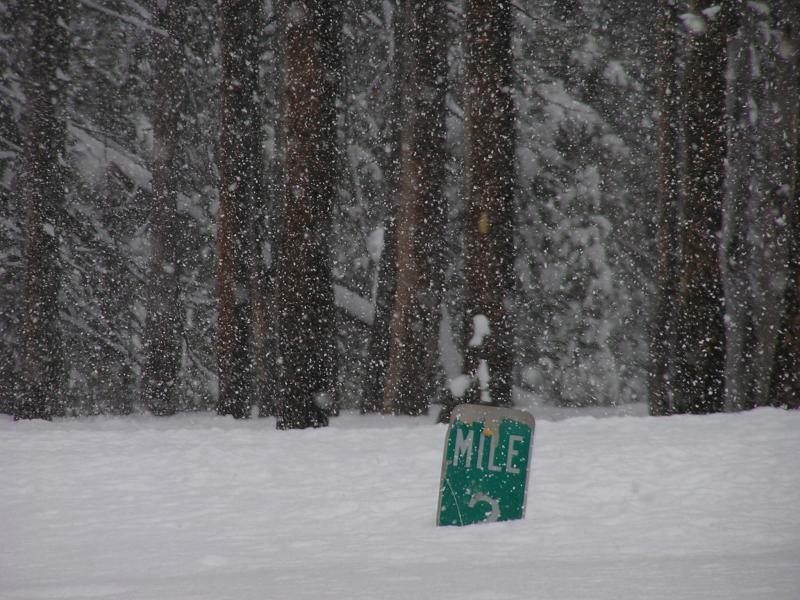 Our driver Preyta was waiting with a sign. Five star service at one star prices! 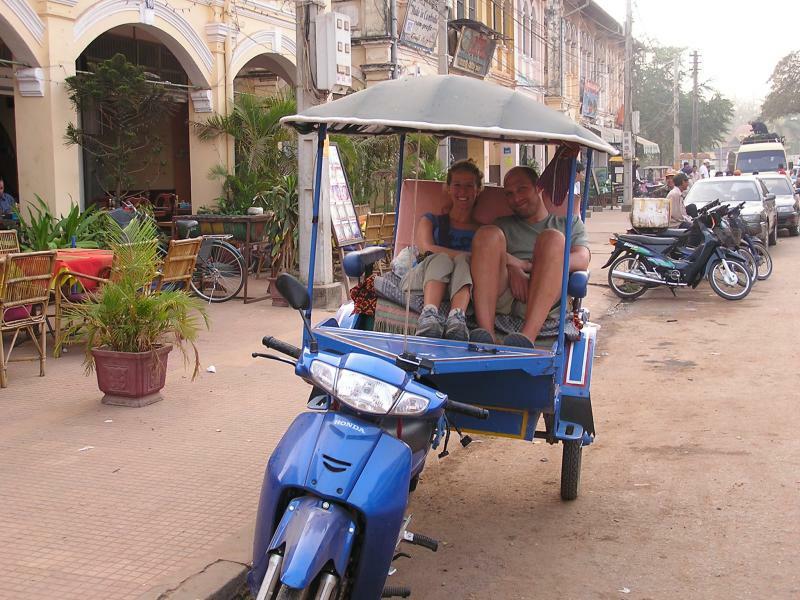 We took the 20 minute drive past Angkor Wat to our guesthouse in an extremely comfortable moto. It's really comfortable carriage with pillows attached to a scooter, very lounge chair-like. We hired Preyta and his Moto for two days to drive us around the many temple complexes surrounding Angkor Wat, which are quite spread out. We considered biking from temple to temple, but it was over 100 degrees with humidity. I think we would've petered out pretty early in the day. The day was long and hot, but well worth the trip over. We had missed sunrise, but were early enough to tour half of what we wanted to see. 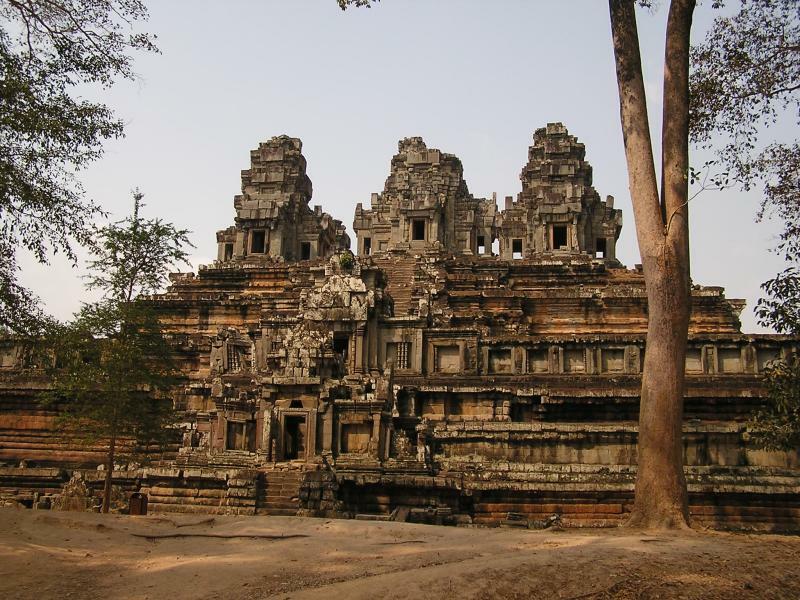 The temple complex was built at the height of the Khmer influence on this region of SE Asia. During the years, 879 - 1191 CE, a series of kings which ruled an area stretching from the Bay of Bengal in the west to Vietnam in the east and also going as far north as the Yunnan province of China and south to modern day Cambodia and Thailand. This complex was a social and administrative complex built in there for the strategic military and agricultural importance. During the reign of the Khmer, citizens worshipped Buddhism and Hinduism, but there were a variety of other cults followed depending on what time period the different kings ruled. People even worshipped the kings themselves. Day 2 was much different because we decided to hire a local guide to fill in where Lonely Planet had left off for touring the main sites at Angkor. We wanted to get our money's worth since we only had 2.5 days to explore. Unfortunately it was not worth the splurge because our guide's English was a bit lacking, and his explanations were extremely specific. He wasn't too good at answering our general questions about Buddhism, Hinduism, and the time period. However, he relayed some interesting factoids and stories about certain carvings and significant ruins. We could have done with a bit of higher-level historical perspective, but later learned all that on the internet. Forget the stories, the ruins were incredible. Monks are still doing sit ins amidst the ruins of these once grand palaces and buildings. Like Tikal in Guatemala, it is easy to see how much effort it took to construct these immense structures. Visiting the main sites of Angkor surprisingly only took us two days. We saw more than the average bear on the first day and then followed up on the second day with Angkor & Bayon Temple, and were ready to call it quits after lunch. At this point, we had seen enough wats to last a lifetime. Apparently another set of ruins was only 35km away. We didn't even consider it. OVERLOAD! You can see the French influence in the town's architecture. We wandered around the city market, visited roadside food stalls, and M had another foot massage. Too bad it's not this cheap at home for an hour of bliss! It is a bit surreal to be in SE Asia having a baguette and coffee in the morning, and then followed up by a traditional Khmer lunch. The food was pretty darn good. There also seems to be more Vietnamese restaurants here than in Thailand. Mmmmm? 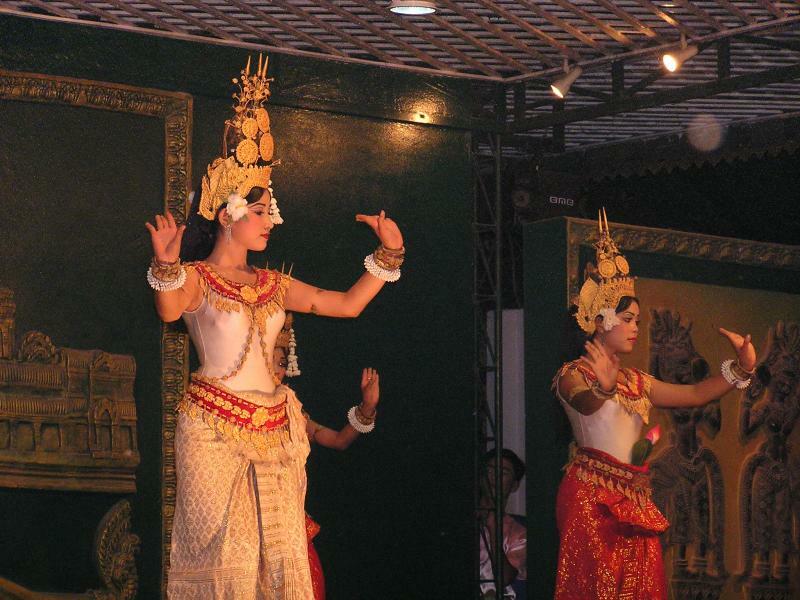 For our evening activity, we watched a traditional Khmer dance show for a few hours over dinner. It was beautiful, but our pictures don?t do it justice. The men, women, and children were incredibly graceful. Our flight back to Bangkok was in the afternoon, but we were done visiting wats. We considered going to a lake nearby and having lunch at a floating fishing village. Good advice from fellow travelers kept us wandering around Siem Reap for the day. According to the grapevine, the road is one of the worst in Cambodia and the fishing village smells like a sewer. Not sure lunch would have tasted so good! Bangkok had become much hotter in the weeks we had spent down south. This humid, polluted, FAST city was quite a shock after quiet beach life. We spent a day figuring out how to get to Siem Reap, Cambodia and a day at the famous weekend market. We splurged one night and caught a movie (Cold Mountain) and ate some great Vietnamese food for dinner at the 7 story mall near our guesthouse. A movie and dinner was $5…not bad! 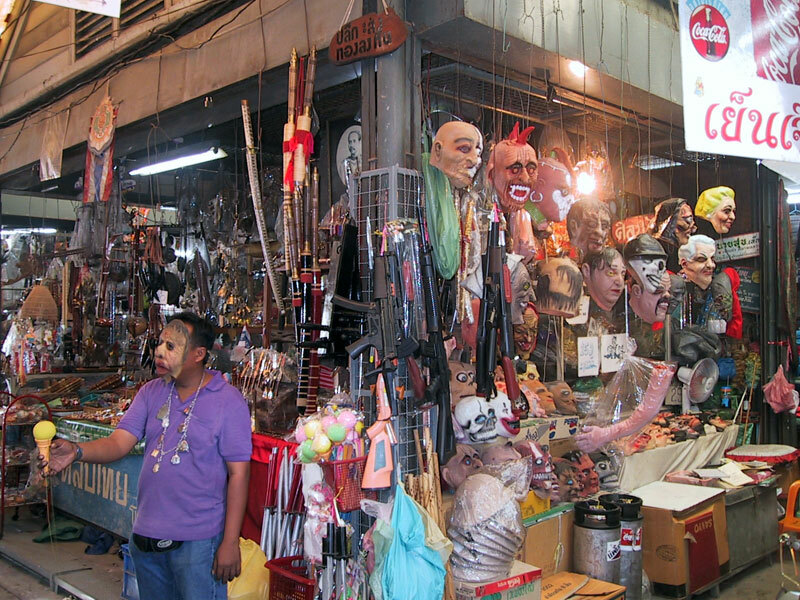 The Chatuchack weekend market was pretty intense as you can find anything you can imagine being sold. The very efficient and cheap monorail was packed with all types of people heading to the massive covered market. This place is great…a mass of jumbled mass of bodies, furniture, animals, food, clothes, jewelry, art, pottery, electronics cleaning supplies, and foot massage shops, all organized by section. 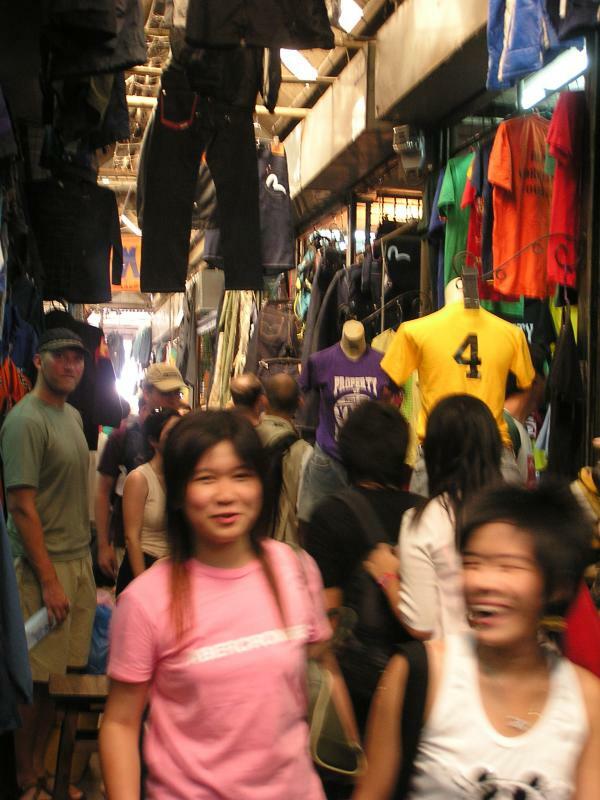 It’s easy to get lost in the maze of alleyways full vendors. We had more fun wandering around than actually buying stuff. We knew we’d be back to fly home and didn’t want to carry anything for the next few weeks. Walking around in the mid-day heat was exhausting. However, M did get an hour’s foot massage at the end of the day for $3 and plans to do her part by eating less to have more fabulous foot massages. We stumbled upon the animal area where we could pretty much buy anything animal worth domesticating from baby squirrels on leashes to guinea pigs, hamsters, and fish. We had heard that the pet section can be pretty off-putting b/c of the types of animals and how they are kept. The animal trade has very little regulation. 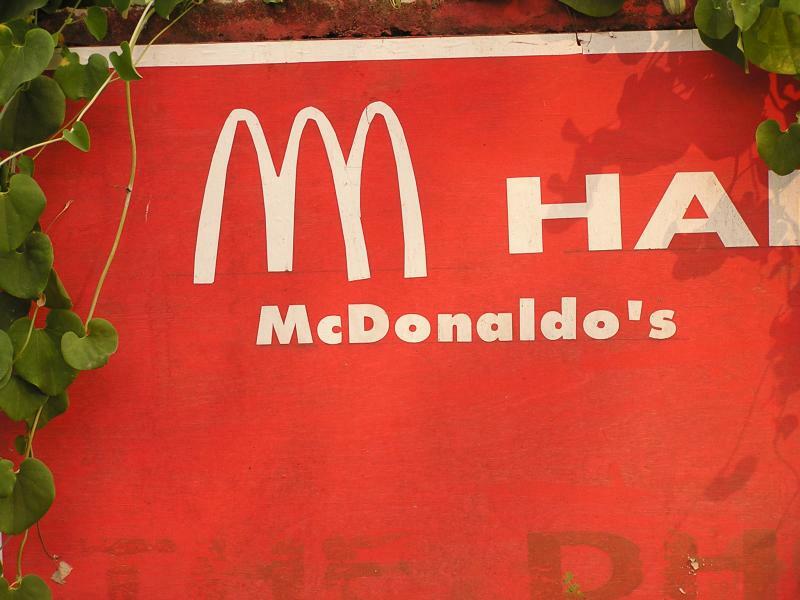 We didn’t’ wander too far and were thankful not to see any monkeys. 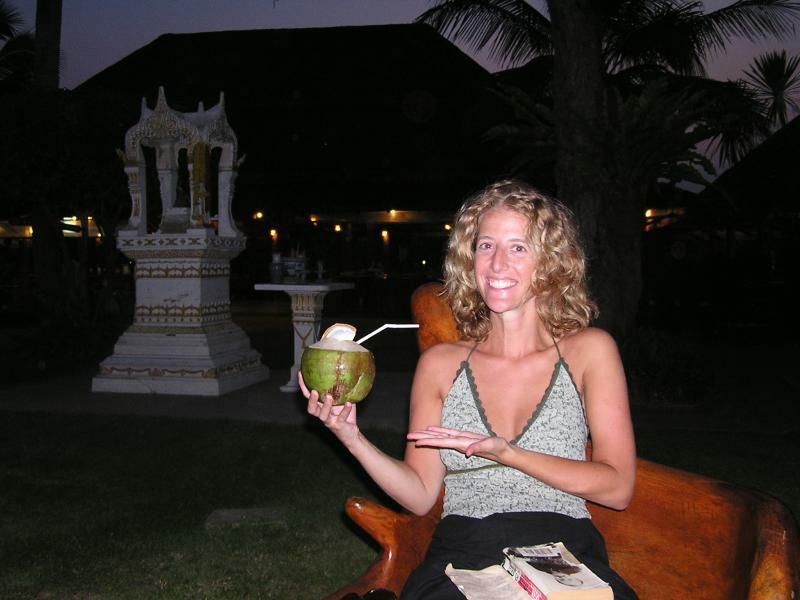 We scooped up a web fare to Siem Reap, Cambodia deciding to eat a little lighter for a few days and lay off of the beer and pineapple shakes. 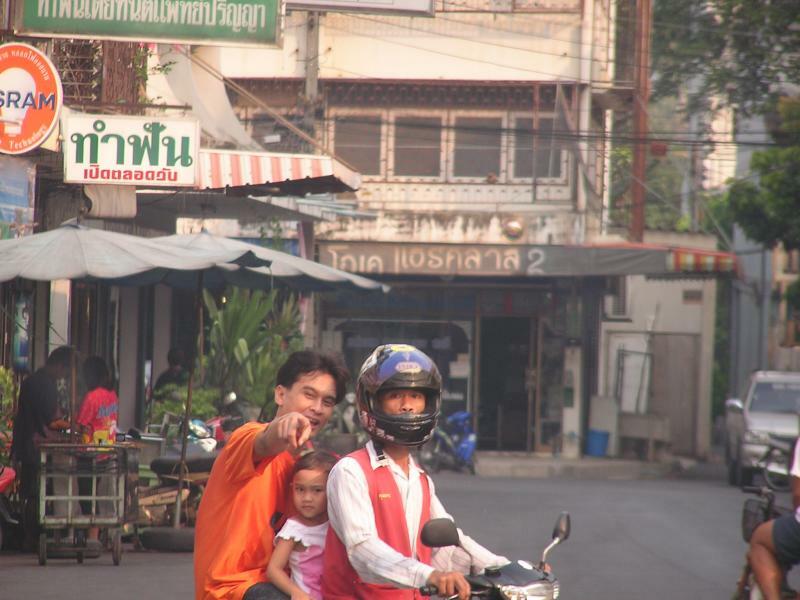 Apparently the roads in Cambodia are horrid. The bus ride would have been 8 hours. I’m sure we would have taken the bus if we had visited Asia earlier in our trip. No sirree, we are completely bused out. The journey took all day. 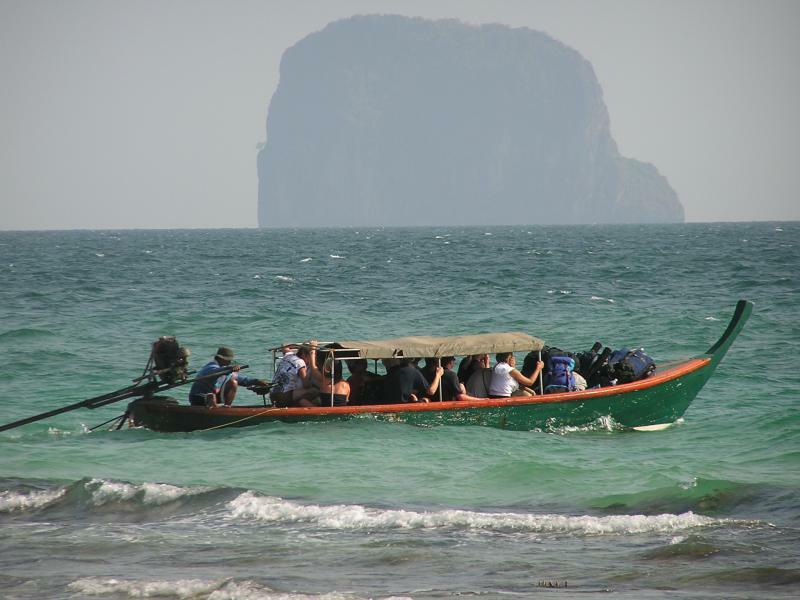 So we found a cheap ticket (<$20) back to Bangkok from Phuket, a touristy island ~ 7 hours north of KBL. Our original intention was to stay on KBL for a week then work our way north towards Phuket, exploring the many islands along the way. So much for that!!! Why mess with perfection? We took the long-tail boat at 9am to meet the ferry for an hour’s ride to the pier on the mainland. 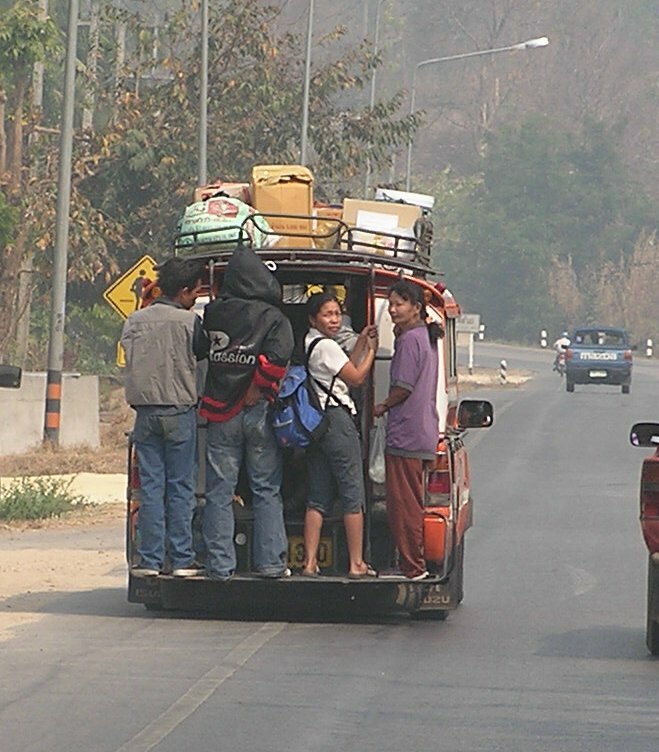 The next part of our journey was a 1.5 hour trip north to the transportation hub of Trang stuffed in the back of a small covered pickup locally called a sawngthaew. We picked up some fried rice and boarded the $4, “air-conditioned” bus to Phuket. 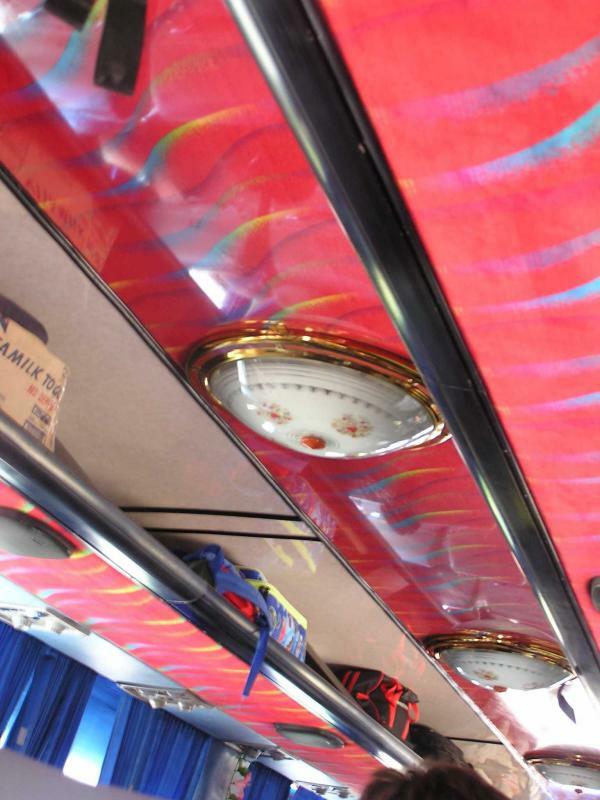 The bus was decorated in SE Asian kitcsh look complete with a karoke video system for our entertainment. The ride was ~6 hours. The air conditioner sucked, and our driver must have spent time in Bangkok learning how to drive. We made it there without puking but vowed to not take a bus ride over 3 hours for the rest of our trip. The poor guy sitting in front of us was puking the ENTIRE trip! We’ve had more than our fair share of pukey bus rides the past two years. Our cheap flight was on a Southwest Airlines-style carrier but with leather seats. Pretty uneventful. Phuket was only discovered ~ 20 years ago and now is a bustling tourist hub full of beach resorts and pollution. 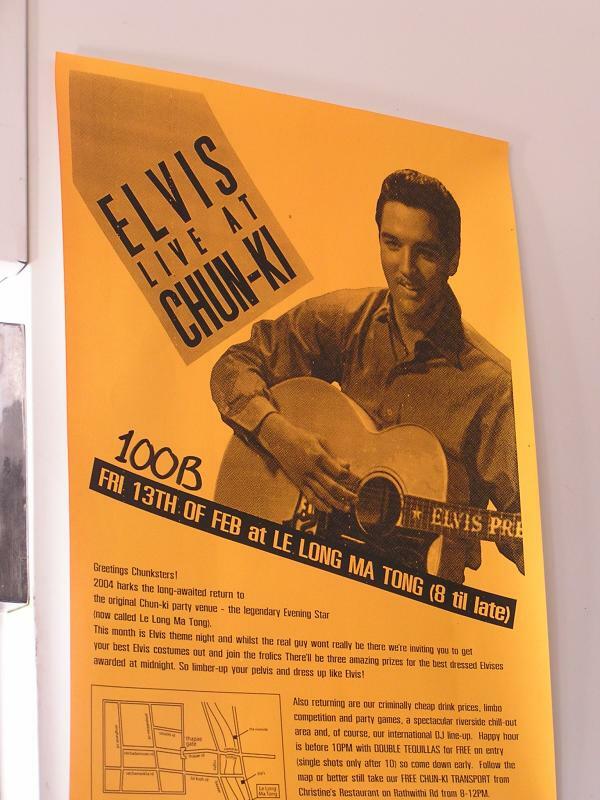 I'm glad we found KBL instead! We must have needed a vacation after traveling so fast and furiously through Israel, Turkey, Africa, and Honk Kong for the past two months. We can't seem to leave our little paradise in Koh Bulon Lae (KBL). Nope, don't want to take a boat trip to another island, get on a train or plane. We just want to sit. And that's we are doing. It's even an effort for us to leave the area and walk 1K to go to another restaurant for food. Why leave here? Everything goes on our tab, and it's cheap and really tasty! This has been one of the most relaxing and fun parts of our trip. What do we actually do everyday? Not much. It's amazing how the days just seem to pass by quickly with not much to show for it. They have a good book exchange here which we've just about exhausted and read the Bangkok Post when it's available to catch up on bird flu details. One of the toughest decisions of the day is deciding which half of the beach to lie on and whether you want to take a swim before relaxing in the sun. Walks along the beach at sunrise are chock full of thousands of interesting shells and coral from the reef just 30 yards off the coast. The random designs on shells remind us of the coats of cheetahs, zebras, and leopards we saw recently in Kenya. M has a little collection displayed on our porch. She is just ripe with ideas for necklace designs. I think that's what happens when you are on the beach for this long. The minute you come home, there's no way you'd wear a shell or shark's tooth around your neck. We've enjoyed trying some new and interesting foods. 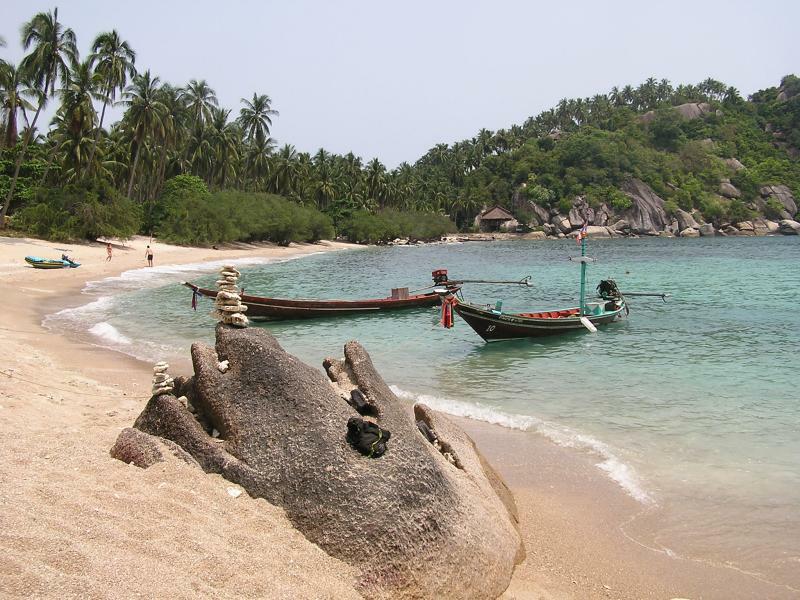 The island is a mix of Thai and Malaysian influence since it is so close to the border. We have noodle dishes about once a day. M is in heaven, as there are so many different varieties of soup: with our without meat, shrimp, pork, squid, lots of veggies, several types of noodles, with coconut milk, lemongrass. Pad Thai and curry are also staples. Green, yellow, red, and mossaman curries are all yummy. We had no problem finding good seafood such as king prawns, barracuda, squid, and snapper. Dave's new favorite dish is Laab Kai - a cold salad of spicy chicken, beef or pork with cilantro, red and green chilies, and cucumbers. Mmmm! As expected, it took a few days for our bodies to get used to the new spices and foods, but no problems since then, luckily! No bird flu for us. No one seems too concerned about eating chicken because as long as it's well cooked, it won't hurt you. Since an Italian woman and her Thai husband run the resort, there are many Italians and Europeans vacationing here. It's pretty cool, people come here alone, with their kids, with parents or friends and spend a month or two relaxing. How much trouble can the kids get themselves into? There were a lot of naked kids running around with tanned bums just as cute as can be. Well, that is except for the evil Swiss devil children who were aggressively terrorizing the cats and other kids. The kittens and cats provided constant entertainment for everyone. We bonded right off with an Australian couple from Melbourne on their honeymoon, Sarah and Mark. Mark is a professional chef and Sarah has taken a new job with a wine distributor - they certainly eat and drink well! 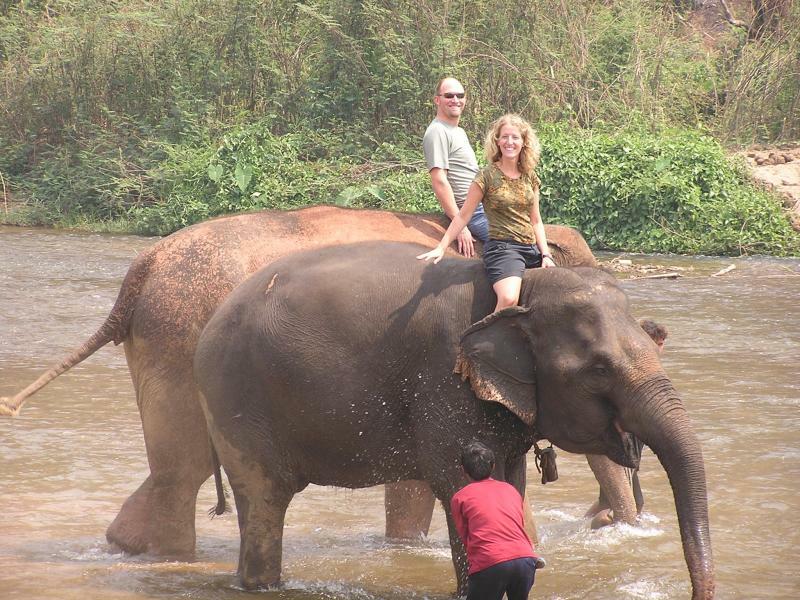 Mark has traveled all through SE Asia and wanted to bring Sarah here on there Honeymoon. Great choice mate! We enjoyed a relaxing sunset cruise with the honeymooners. Some years ago Sarah spent a lot of time rock climbing in the states and met too many Californians. She brought back the term 'Dude'and all it's iterations to our vocabulary. Thanks Sarah, we've been saying it way too much lately. They are a lot of fun and hope they can come visit us in the states sometime, or better yet maybe we can visit (someday), eat some great food and Aussie wine. Yeah, we need to head back down-under one of these days. We really enjoy it and our 3 months wasn't enough time. The Roger Moore version of James Bond was on Koh Bulone Lae. This handsome, 47 year old, tanned, Austrian had the air of an international man of mystery. He always seemed to have a gleaming, white smile on his tanned face, a cocktail or wine in hand, a cigarette (complete with 4" cigarette holder), and an interesting story to tell. He was one of the nicest people we met on the island. He lives there for 6 months and returns to Austria to run a lakeside resort in the summer months. Nice life. Of course, he was too stealthy for us to get a picture of him! 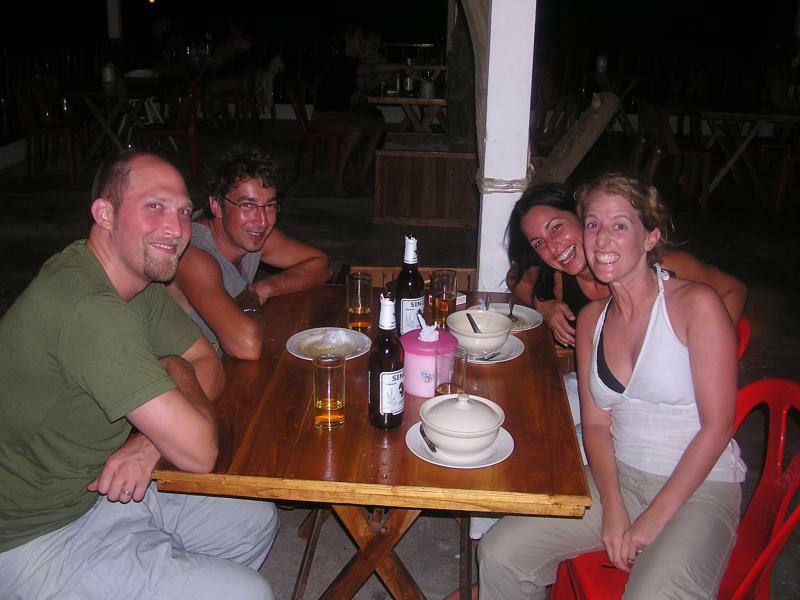 We spent some time hanging out with a Danish couple and his parents who have been visiting the island for 7 years. John was about 6' 6" and tipped the scales at close to 260. He would have been a good prospect at tight end for the NFL. Funny thing, he's the last person you'd expect to specialize in hair and make-up for fashion shows. M is remiss that she didn't ask for a haircut. Not a problem for D.
Twice while we were on the island, kids from elementary English school classes from other islands came to KBL to speak with tourists to improve their English skills. We'd be sitting on the beach reading, and a bunch of giggling kids would come up and ask us "Where you from? ", "You like beach? ", "What you name?". After 10 minutes of basic conversation, we were invited to a party complete with games and food. It was really fun! The kids treated us like royalty, serving us food and drinks non-stop. Dave won a prize for his aggressive playing of musical chairs. Anyone who knows D would be suprised that he even went up in front of a group of 100 people to play musical chairs. OK, I threatened just a little bit... My shy husband had a blast but was red as a tomato (sunburn maybe?) when they awarded him a little elephant key ring! I was partnered with a 12 year old about my size to play a game in which we had to stand on a piece of newspaper that is folded in half after each round of music. Our jobs as partners were to keep our feet on the paper not on the ground. The kids REALLY enjoyed this one. Some of the male tourists were paired with these girls from class. The Thais are so modest that the place was roaring with giggles when the guys had to pick up the girls to keep their feet off the floor. It was great! We plan to vacation in KBL again someday. This island is so peaceful, not very developed, and off the normal tourist route. 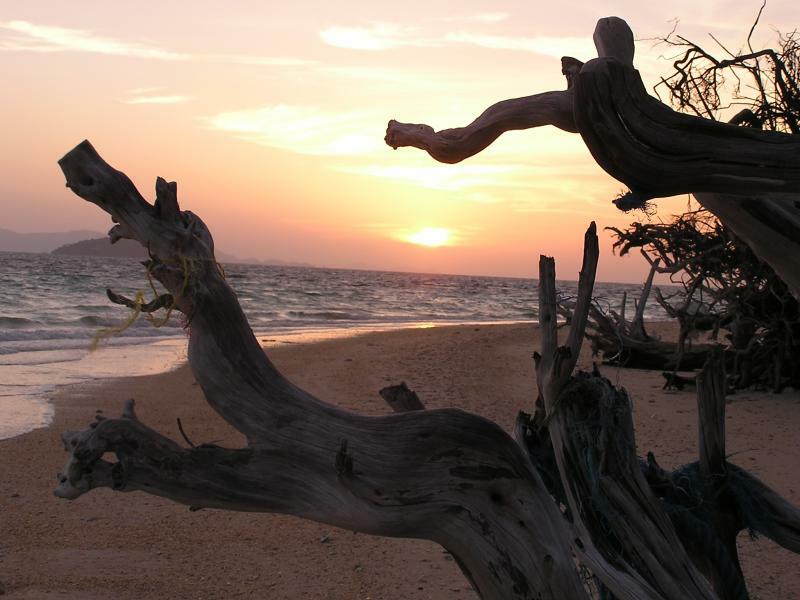 We may have found a little paradise and hopefully Lonely Planet won't find out about it! We are now doing absolutely nothing on a very small island in southern Thailand. We are pretty close to Malaysia on the Adaman Sea. The overnight train from Bangkok was much nicer than we expected. We upgraded to our own sleeper complete with a sink since Dave had such a hard time fitting in the dorm-style sleepers in Europe. We were a bit wary of the lovely chicken dinner included with our fare since the news is filled with not very useful information about the bird flu. Hunger prevailed. No fever as of yet. We arrived in the buslting town of Hat Yai first thing in the morning and had to wait a few hours for our 2 hr. mini-bus ride to Pak Bara pier. We took the advice of our guidebook and found a Chinese hotel that supposedly served "real" coffee. No such luck, as we endured yet another cup of Nescafe. No, it's not growing on us! We had a yummy bowl of noodle soup to accompany our breakfast. It actually wasnt' THAT weird having soup for breakfast. We luckily scored the front seat (thanks to D's long legs) for the steamy ride from the western side of Thailand to the east coast. After yet another yummy, filling, and cheap meal of pad thai, we boarded a ferry for an hour to the island of Koh Bulon Lae. We passed the most amazing rock formations and small islands along the way! The ferry stopped a few hundred yards off-shore. We dumped our packs into a long tail boat which took us the rest of the way. We've been on the island 5 days and anticipate staying another week. We had planned on working our way north checking out several islands along the way. Not so sure now... We've found paradise. Since the island is so far south and hasn't made it into the popular guidebooks, it's not overrun with tourists. Good news for us. Many Europeans here. Clean beach. Our bungalow is $5. A nice meal with drinks is $10. An hour's massage is $7. However, an hour on the internet is $12...Rip off... We are going to try to unplug for a while. Back in the USA and still traveling! Last Week of our trip - Beaching it!